You may have heard of the recent trend surrounding tiny houses: how their diminutive size, portability and lack of an attached mortgage is offering people a chance to own a home of their own, debt-free. Often coming in at under 400 square feet, these tiny houses might be built on a wheeled trailer base, or it might even be a converted vehicle, like a van. 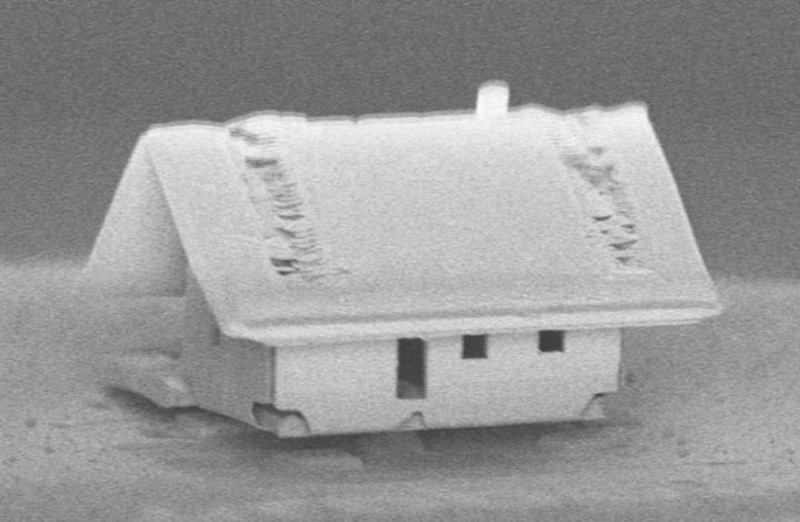 But researchers in France’s Femto-ST Institute have built what might be the teeniest, tiniest house of them all: a structure measuring 20 micrometers across that sits on the end of an optical fiber (to give you an idea of how small this is, a micrometer — also called a micron — is equal to one one-millionth of a meter). To begin, a thin layer of silica was placed on the tip of a cut piece of optical fiber that was thinner than the width of a human hair. 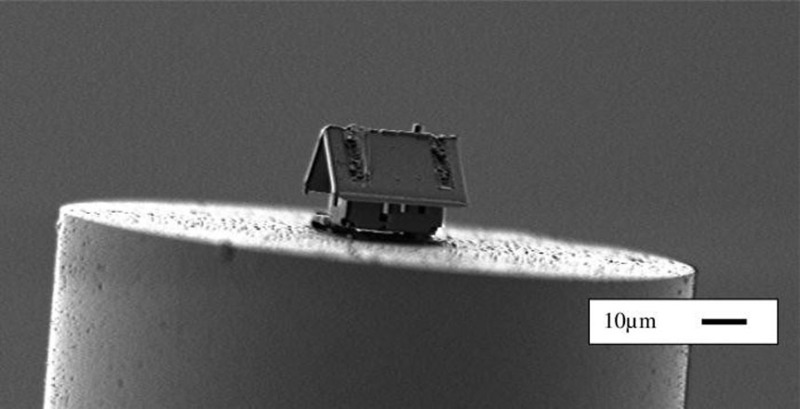 The μRobotex system then used a dual-beam scanning electron microscope to allow two engineers working in tandem on different computer workstations to guide the focused ion beam to score and cut through that sheet of silica to create the walls, windows and doors — all on an area measuring only 300 by 300 micrometers. As one can see from the video, the house was conceived as a whole piece of Japanese-inspired origami that could be cut out as a flat layout and then folded into shape, rather than going through the relatively more difficult route of attaching separate pieces together. In fact, the whole process was meticulously planned step-by-step to bring the structure together: by altering the power level of the ion beam, and by scoring or cutting in specific places, the forces from these actions were able to prompt the walls to crease up on their own. After cutting out the walls and getting them to fold them up into place, the gas injection system was then used to weld the corners together. Finally, the roof was cut out of the same sheet of material and placed on top. The ion beam was then put at a lower-powered setting and used on a “sputter” setting to carve out the “tiling” of the two stripes on the roof — quite an achievement, considering how small the structure was. 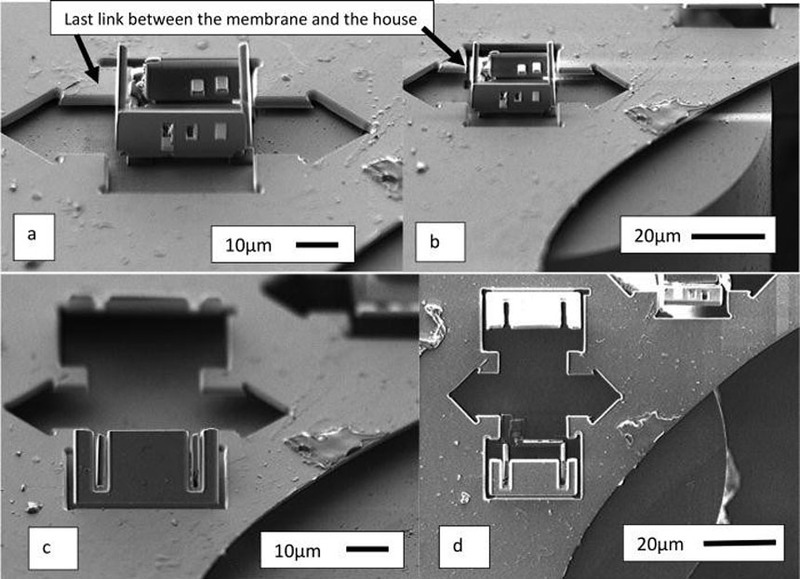 The project shows how we might be able to someday accurately assemble microscopic constructions out of different materials, resulting in components that would measure smaller than the width of a human hair. Such components could be utilized as sensors, capable of being inserted into human blood vessels to detect pathogens, for instance. According to the team, the experiment proves that the precise three-dimensional cutting, etching, folding, assembling, and welding of thin membranes of wide-ranging materials such as metals, polymers, or crystals is possible with such a nanorobotic system — something which was not previously possible with non-robotic systems. The team is now aiming to build even smaller constructions on the ends of carbon nanotubes, which would measure an even more infinitesimal 20 to 100 nanometers in width (keeping in mind that a nanometer is one one-billionth of a meter). That future step would make light-trapping nanoantennas, nanophotonic crystals, 3D biosensors and nanopatterning on tiny surfaces or carbon nanotubes much easier to execute. To find out more, read the paper in Journal of Vacuum Science & Technology A.